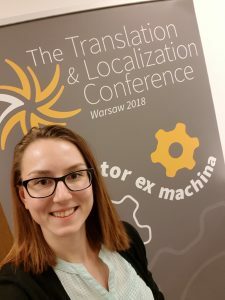 Last week I visited Warsaw for The Translation & Localisation Conference 2018. It was amazing and inspiring to meet other linguists from all over Europe, listen to the presenters talk about the latest developments and changes in the industry, and geek out on linguistic topics (although we do that pretty regularly here in the office, too!). One theme that was the centre of attention of this year’s TLC was the ever so trendy and much-discussed machine translation. The subject of machine translation or MT is impossible to avoid nowadays and it frequently pops up in conversations in linguistic circles: key words such as neural, adaptive, post-edited often make their way into discussions and it wasn’t any different at the Warsaw conference either. I must admit I have slightly ambivalent feelings about the use of MT and I am generally a bit apprehensive about it (see my previous blog post on the topic). The presentations and the discussions with colleagues at the conference were invaluable as I could hear others’ opinions which reassured me: the arrival of MT may not be the end of the translation world after all. Of course, there were translators at the conference who voiced their worries about MT: they fear they will lose out on projects because machines will take their jobs or their hard work will lose its value as clients will prefer the cheap and quick machine translation instead. Others were more optimistic and have noted that since they started using machine translation (strictly with post-editing! ), their productivity has increased a lot which actually means that they can take on a lot more work. One presenter, Aaron Schliem has envisioned that translators will have to diversify as their role will fundamentally change. There won’t be a need for “translators” in the future, as localisation professionals (or as he called them, “globalists”) will be involved from the product design stage, they’ll be advisors at multinational companies, they’ll work as creative copywriters as marketing material will not be translated but written in the target languages from scratch with the target audiences in mind. In his view the translation industry will dramatically change in the coming years as MT becomes more and more reliable and machines learn to learn from their mistakes. While we can only guess at this point how MT will affect the industry in the next decades and each and every person I heard or talked to at the conference had a different opinion about that, there was one point on which everyone agreed: machine translation will not replace human translators. Although it might change the way translators work, it will not take their place and it will be only used as a tool to aid translators’ work and increase their productivity, just like computers, translation memory software, the vast information found on the internet… Clients should not and (hopefully!) will not use machine translation without human involvement as the results will never be the same as if a text was written by a living, breathing translator. And, as one of the presenters put it, if we ever get to the point where machines and AI can write just as creatively and intuitively as a human, well…, then we will have other things to worry about. My vision is that in the near future (2-3 years), MT will take away the jobs that professional translators would either not get anyway, or really wouldn’t like to get them. MT has been there for years and it is still unable to capture the spirit of most texts – only a human can do that. I don’t like it and avoid using it. It is not that simple and it takes away precious time from the translator to accommodate the MT and the manufactures that want it to work at any cost and try to sell the idea that it makes miracles. What about using MT for PDFs for fiddly layouts that need to be reproduced? Sorry, I’m not convinced! Previous Previous post: Happy World Poetry Day! Next Next post: Language of the Month – April is SPANISH!